There is widespread frustration among the North American Splatoon community over Splatfest. KoopaTV readers read my detailed, reasoned rationale for my team picks for each North American Splatfest (in 2015, that was rated to be the best article series on the site — and it's still continuing into 2016). However, not everyone chooses their team decisions based on principle, or based on which team they genuinely like the most. There is a growing group of players that try to “meta-game” Splatfest: Choose the team that is most likely to win. How do they decide which team will most likely win? In North America, there appears to be a pattern where the winning team has low popularity, and a high win rate. Meaning, choose the less popular team. More astute players believe that most of Splatoon's player base in North America are children, and children are more likely to pick a certain team. Therefore, pick the other team, for children are less skilled. Central to this is the calculation for which team wins: Currently, it is Score = Popularity% + (Win% * 6). The Win multiplayer was originally 2, then it moved to 4. For most of Splatfest history, it has been the current 6. This basically makes the winner of Splatfest to be the team that wins the most, since Popularity is basically rendered useless. Popularity is little more than a very interesting reported statistic — and I'm glad it's reported. The more statistics we know, the better! Of course, I'm a stats nerd. The increasingly important role for Wins stemmed from the massive anger Team Cats had against Team Dogs in the very first Splatfest, where Team Cats had 51% wins but only 38% Popularity. The Team Cats team said that 2% difference (51–49) would be very significant and that, given the number of matches, Cats must've done better than Dogs by thousands of matches. We all expected most Splatfests would be determined by Popularity since we thought the wins would be 50% each. All 36 Splatfests worldwide, ordered by highest win percent to lowest. Winning teams only. Don't think anything of the fact that Popularity percentage is much higher for low Win percentage Splatfests. If it wasn't for that, they wouldn't win. Team Love is the most underwhelming team, by the way. 51% Win and 47% Popularity is the lowest-scoring winner of all. Is there validity to the concern that North America is dominated by low popularity, very skilled teams? Let's look at all the winners in a scatter-plot! Let's count some quadrant statistics. Obviously, no one is going to be in the lower-left quadrant because that's mathematically impossible. Five teams (two Japanese, two American, and one European) are in the upper-left quadrant. That means they won off of popularity because they had a sub-50 win rate. As I said, you should expect those to be among the most popular winning teams. Twelve teams (six Japanese, one American, and five European) are in the upper-right quadrant. This means that one-third of teams have won by winning majorities for both popularity AND wins. Half of Japanese teams have won this way, including the most popular Splatfest team of all time (Milk Tea, which had 68% popularity and a 55% win rate). Nineteen teams (four Japanese, nine American, and six European) are in the lower-right quadrant. This is over half of all Splatfests, and this is the Splatfest result that Americans are the most used to: Lower popularity, and higher win percent. There is a strong difference between each of the regions, so let's see it statistically with the average (mean). Look at the significant differences between regions! The average popularity percentage for winning teams in North America is 45%. In Europe, it's 49%, and in Japan it's 54%. For win percentage, it's 54%, 54%, and 53%. This implies that, more or less, the win disparities between the victorious and failing teams are basically the same worldwide. Popularity? It's massively different. For Japan, winning teams are also popular. In Europe, it's sort of balanced. While in North America, there are wide differences where it really is true that the less popular teams win more. Is this because there is a conspiracy in America where the top players collude on the less popular team, and that conspiracy doesn't exist in other parts of the world? That doesn't make any sense. The Japanese can be just as conniving and vicious as American players, if not more. They are much more organised in their scene than America is. 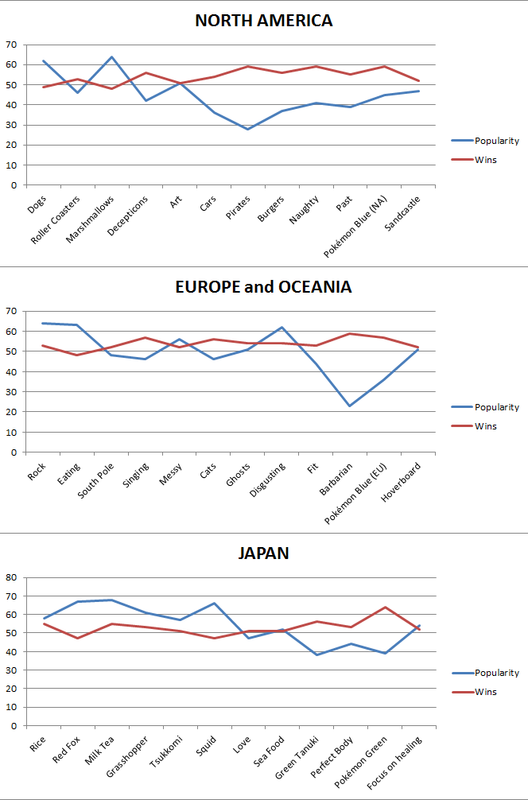 I think this is a function of the cultural differences between regions. 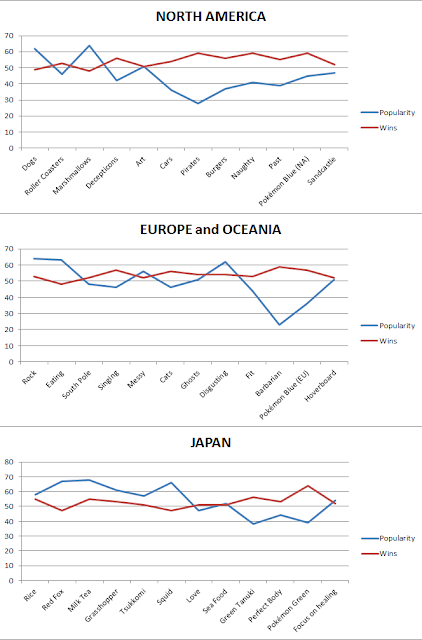 In North America, there is an individualist streak, while Japan has a collectivist one. For Japan, that means that people want to go together, and the majority opinion (most of society) wins. North America — or at least the United States, which makes up most of North America's players — has a culture and a system of government that strengthens the minority. Remember, America isn't a democracy. The fact it's a Constitutional Republic means that there are many protections to the minority, and the minority in population can actually get what they want in the end. And that's exactly reflected in the Splatfest results. 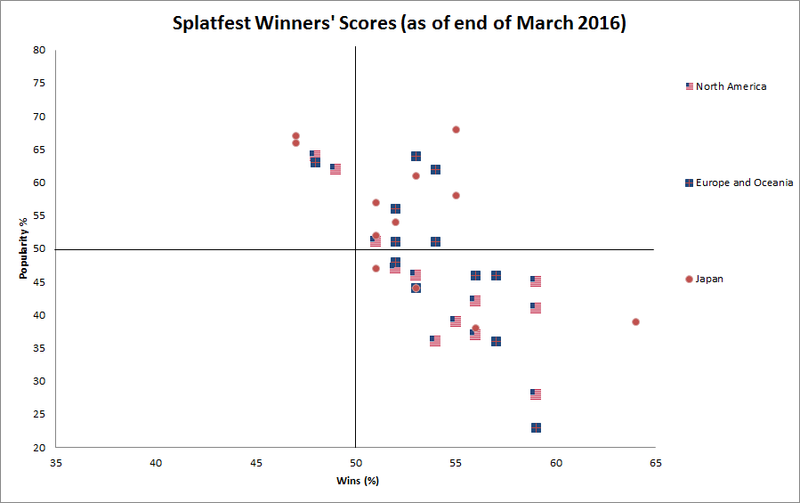 Just over half of Splatfests worldwide has the minority team winning. I think, and obviously I'm biased here, that the minority representation is a good thing and Splatfest isn't fundamentally broken because of that. It might be broken for other reasons, but not because of score distribution and patterns. Line charts of all three regions with Popularity and Wins. The Splatfests are ordered chronologically. So... Is one region setting the trend and influencing the other regions? There was a three-Splatfest trend where all three regions had sub-50 popularity and above-50 win percentages, ending with the Pokémon-influenced Splatfest. The trend then ended in Europe and Japan, attributed to the new Splatfest mechanics which dramatically affected matchmaking that made the results a lot closer in all regions than before. That particular Pokémon Splatfest resulted in the only Splatfest team to ever break 60% wins: Pokémon Green, at 64%. Was that the result of an American-style individualism run amok? Or did the entire world just simultaneously, and in an epic fashion, reject Charizard? I like to think it's the latter. It was a massive subject-specific outlier. I want to note that if there was a persistent conspiracy, then maybe the popular team members caught on and some of them are flooding the unpopular team ranks to even it out again. That, or there is no conspiracy. That, or people aren't as good at predicting who is popular and who ain't as they thought they were. Statistics and nice Excel-produced charts can't give us the answers to those questions. They just help us make informed, evidence-based decisions based on data. This article was made because of a series of requests! You can submit a request, too, right here! This is one of the few articles that Ludwig has made graphs for where it actually made sense to make graphs, as opposed to using graphs as a humourous gag. Ludwig thinks those other times were funny, at least. Are you a nerd like him and use Excel spreadsheets for fun? And what do you think of the Splatfest situation? This article on the effects of the Summer 2015 Miiverse redesign half a year after it came was implemented also actually made a great use of Excel. People are scapegoating the Popularity stat for their own failures. "Nineteen teams (four Japanese, nine American, and six European) are in the upper-left quadrant. This is over half of all Splatfests, and this is the Splatfest result that Americans are the most used to: Lower popularity, and higher win percent." I think you mean lower-right. Yeah I dunno directions thanks. While Team Love had the most underwhelming win, it was the first time the less popular team won in Japan. Well, it was clearly very close. After, it was very close in the other direction the next Splatfest there where Sea Food won. So which is considered more impressive? Barbarians with the least popular team to ever win or Pokémon Green with the highest win rate? Pokémon Green is my gut answer. Honestly, Barbarians aren't so impressive because they won, it's impressive for them to have such low popularity to begin with. And it's equally impressive for Ninja to have such high popularity — and considering Pirates vs. Ninja was the Splatfest with the SECOND most dramatic popularity differences, I think we can give all the credit to Team Ninja. So in terms of actual achievement, it's Pokémon Green because that's an insane win rate. Then Ninjas for being widely popular across the world.